The Grail is a life-changing, transformational journey for men based around a rite of initiation for each man. It is an initiation into the feminine mystery and thus uniquely guided by three women who serve as midwives through this extraordinary and powerful rite of passage. The three-day weekend is challenging, and requires courage and the willingness to meet the unknown. It also requires that each man feel his longing to meet his own unique essence, his most authentic and essential nature. It is a reclamation of part of a man’s soul and allows tremendous healing and transformation. This space allows each man to be held in the most loving and sacred space as he explores any limitations, fears and wounds he wants to move beyond. Infinite opening is then possible. Each man is welcomed to a powerful breakthrough and the possibility to welcome his wild and instinctual self, his full potential as a man. Each man’s own rite of initiation, as well as being witness to the journeys of others, allows him to find right relationship to himself, his body, his loved ones, his community and the earth – symbolised in the image of the green man that is used for The Grail. This archetypal figure stands in many cultures for rebirth into male power in harmony with nature and the feminine. 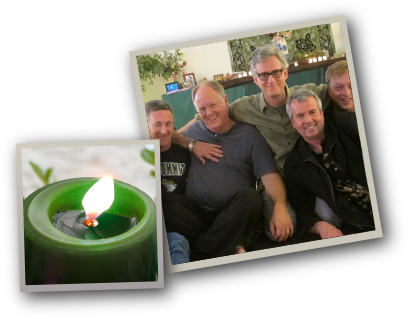 Many speak of a homecoming, a self-remembrance, a deeper grounding in their own masculine being, and a life-changing experience through this weekend journey. 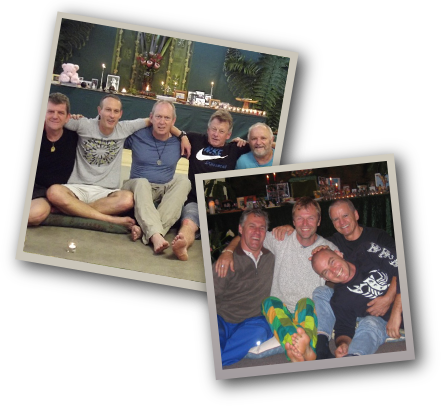 There can be a new and deeply satisfying experience of ongoing brotherhood. The Grail offers a vast and limitless, healing and safe space that can hold anything, and offers the most amazing and unique transformation. The Grail is unique. You won’t find an experience like this anywhere else, particularly in the fold of a men’s event or “men’s work”. It is memorable, challenging, confronting, nourishing and lasting. It was very intense for me. The men completely had my back. The funny thing is I went into The Grail wanting to be a better husband and father, but came out of it with so much more than that. A place to meet myself in total honesty and that I matter in this sometimes crazy world. I’ve learnt that I have a voice and to speak up. Even when others may not like what I have say. For me The Gift was a place to be heard, validated, loved, cherished and to be given space to find true meaning in my life. I feel it was a place to heal my heart and to support healing and truth about myself. This change is so big that I don’t even recognize who I am at times. I hear Spirit in myself answering for me and it is not that I am thinking everything all the time now. I feel calm and at ease with who I find myself to be in a whole new way. The ongoing support is amazing; I feel safe to show up just as I am, and being held in this way I am constantly growing and evolving, always deepening my connection to myself and in turn my capacity to hold others in compassion becomes stronger all the time. At that first Gift I attended I sat and watched the guides and said “one day I’ll do that for women”. The inspiration for me was in the witnessing of such transformation within the women and the great power that was held in sacred space. The Gift space offered a communion with my deep self that few other things offer and that it is remarkably easy to truly transform in this kind of space. It has informed my understanding of myself and other people beyond my expectations. I have done lots of workshops and retreats but The Gift is like nothing I have done before. It’s hard to describe in words and I have received so many compliments since I attended. My friends say, “I want what you’ve got”.